A good meditation requires a focused mind and the ability to ignore all distractions, inner and external. You would not reach far if you allow every thought, sound or physical sensation to distract your attention and take it away from the meditation. Can you ignore all the thoughts that pop up into your mind when you sit down to meditate? Can you ignore the voices and noises around you? Can you ignore itching, contracted muscles or any pain in the body? Can you ignore all the memories that well up from within you and occupy your attention? All kinds of feelings and sensations might arise when you begin to meditate, attracting your attention and disturbing your focus. You remember things that people said or did, and this could awaken negative feelings within you. Your attention might go to problems and difficulties, and worries might fill your awareness. All these distractions take your mind away from the meditation. Besides good concentration, what can help you ignore everything when you sit down to meditate, so you can do a successful and focused meditation? There is an important ingredient that can help you ignore distractions, and that is emotional detachment. What is emotional detachment? This has been explained in other articles on this website. In short, emotional detachment is the ability to stay calm and undisturbed in difficult and stressful situations, and to ignore negative emotions and negative thoughts. This skill helps you to avoid being emotionally upset in the various situations of your life, and not take things too personally. 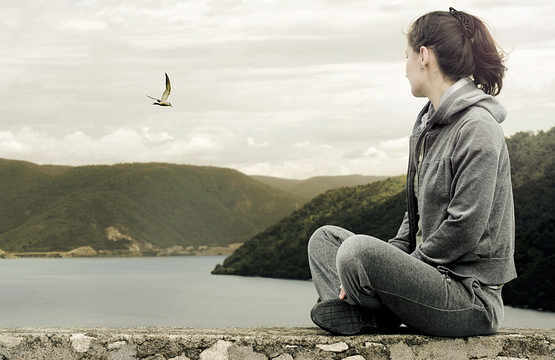 Emotional detachment plays a vital role in successful and focused meditation. It helps you ignore all the thoughts and emotions that rise during meditation, as well as external distractions. The kind of emotional detachment I am talking about has nothing to do with being indifferent and keeping away from people. I am talking about being calm and in control of your mind in the various situations of your life. By developing a certain degree of emotional detachment you will be able to ignore distracting thoughts and emotions during meditation, and you will therefore, progress faster. A certain degree of emotional detachment, and a regular practice of meditation, would make you a balanced and calm person, who is undisturbed by people and circumstances, and who does not allow negative situations to affect his or her state of mind. 1. Don’t react immediately when you hear something you don’t like. Count from 1 to 10 or take a few deep breaths. 2. Try to be aware of thoughts that run through your mind, and strive to avoid paying attention to negative, disturbing or meaningless thoughts. This might not an easy to do, but with perseverance, you will succeed to chase away unsavory and useless thoughts. 3. Learn to let go. Release your past and your memories and stop letting them confine and control your life. Remember that dwelling on the past will get you nowhere, except tying you down to one place and not letting you progress. 4. Focus on the present moment. The past is gone, and the future is not here yet. What really exists is the present moment. Learn to live in the present moment by focusing on your current actions. Do not do one thing, while at the same time thinking of something else. 5. Don’t take anything too personally. It does not matter what people say or think about you. Your happiness and well-being do not depend on what people think, say or do. There is no reason in the world why you should let anything make you worry or become upset and agitated. Following these guidelines in your daily life, will ensure that you will be able to display emotional detachment while meditating. The more detached you can become during meditation, the more you will be able to disregard and ignore irrelevant thoughts, unhappy memories and the noise around you. This will help you progress faster, and meditate better and more deeply. Imagine how free, calm and happy you would be, if you could stop taking things personally and getting upset by what people say or do. Learn emotional detachment techniques that will help you let go of worries and negative thoughts, and deal calmly with upsetting situations and stressful people. Remez Sasson is the author and creator of Success Consciousness website. He writes books and articles to help people improve their life, achieve success, gain inner strength and inner peace, and become more positive and happy. What Are the Six Important Keys to Success to Follow?